Keeping track of your period is useful so that you can be prepared, know if you're pregnant or if you go to see the doctor. The average menstrual cycle lasts 28 days but everyone is different and it can vary between 21-35 days especially if you've just started it's normal for your periods to be irregular that's why you should be prepared! To track your period you need a calendar that shows the whole year and a highlighter. You can print these ones out below for example. Highlight the days you get your period, small dots for light days and/or spotting and big dots for regular and/or heavy days. Then once you've marked at least two periods count from the first day of one period to the first day of your next period (ignoring any spotting in between). This is the length of your cycle. Do this for four periods and you should be able to work out your average cycle. For example, if you had 30 days for one cycle, 25 days for another cycle and 29 days for another cycle your average is around about 28 days. Then you can count this number from the day you start your period to get an idea of when your next one will be arriving. Make sense? I hope so! There are also some applications you can use that track your period for you if math isn't your thing. Kotex have a period tracker that emails you. Click here to check it out! 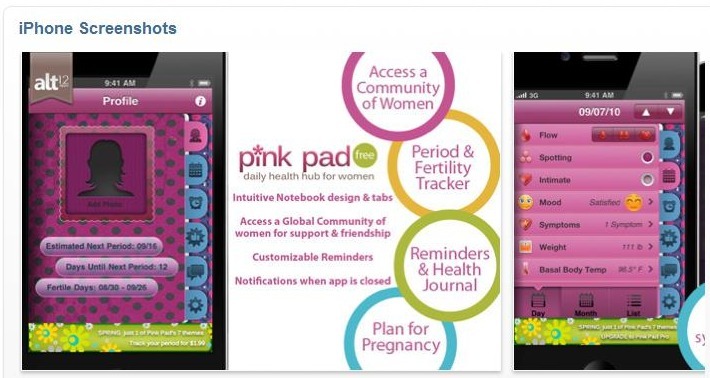 BeingGirl also have a period tracker, click here to have a look! Or if you have an iPhone or iPod touch you can download an app called Pink Pad it's free or you can get the paid version for more features. Check it out at the itunes store. Once you can manage to successfully track your period you can start wearing a liner when your period is due. That way when it arrives you won't leak into your underwear. If you're quite an unorganised person who just can't be bothered to track their period or your period is irregular wearing a liner everyday would be a good idea.